Before traveling I made a list of shops I had to visit.... places I read about and wanted to see first hand. Luckily Edie was willing to see them too! 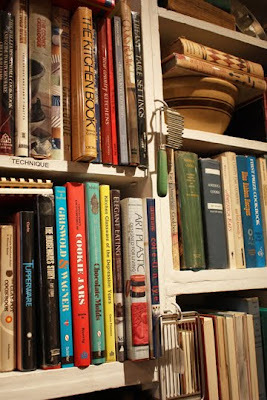 If you read this blog you know I love to bake....but what you might not know is, I love to read cookbooks too. 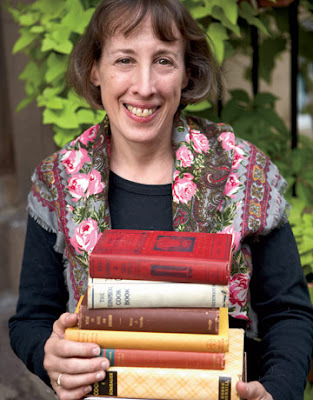 So it's no surprise while in NYC I wanted to visit Bonnie Slotnick's Cookbooks. 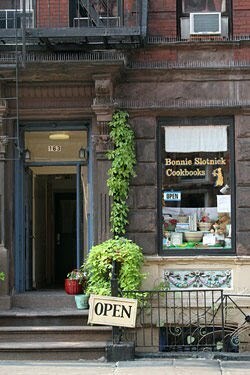 Bonnie has a great shop nestled in Greenwich Village filled with enough recipes of gastronomical wonders to last a lifetime. As you walk through the door, you immediately know Bonnie is passionate about what she does. Edie found a chair to settle into as she took time to study the available books. 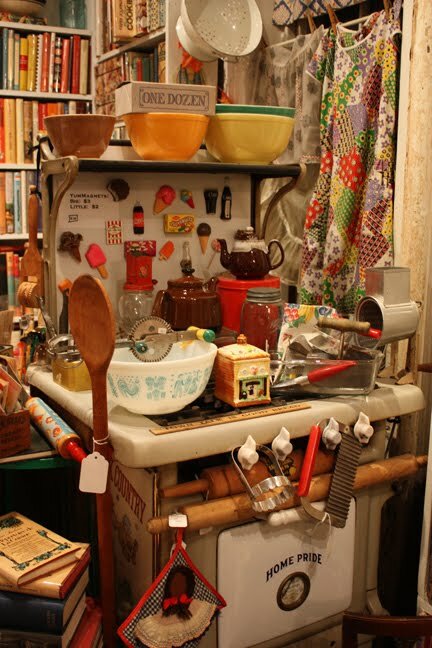 Bonnie has a limited assortment of kitchen tools, aprons, bowls and tea towels. Just enough to add visual interest to her store. 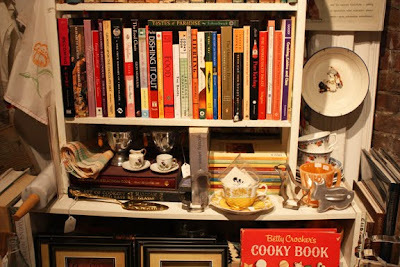 Tea cups and cookie cutters litter the shelves. 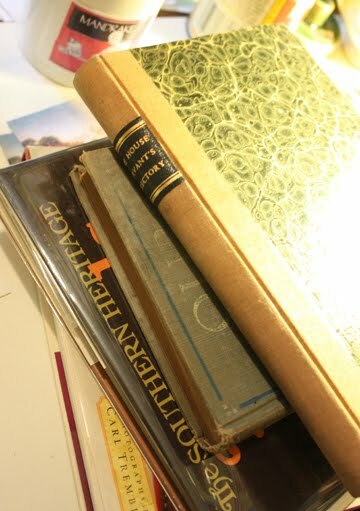 A small book, Tastes of Paradise, is tucked horizontally on the shelf. Wish I would have seen it while there. Bonnie is willing to check her shelves for a book you need and mail it to you. She told me they know her well at the post office. She's sending my selections to me as I didn't want to lug heavy books home. I asked Bonnie what was the most valuable cookbook in the shop. She proceeded to pull The House Servant's Directory out to show me. This book was written in 1824. It has been professionally rebound. I wish I could have taken a picture of the inside of the book for you....but when she told me the price, I didn't touch it. She thinks it would sell for about 5,000 to 10,000 dollars, a bit more than I had in my purse that day! The picture above is of my son Jeff. He's a student at NYU. He met us at the store before dinner. I'm including him here to give you an idea of the size of the shop. He pretty much fills the store. Call Bonnie before going to make sure he isn't there! You don't want to have to move him out of the way while browsing! Make sure you save plenty of time to check out all of the titles on the shelves too. I think an afternoon would be about enough time. Bonnie's shop is open from 1-7pm. I took Elizabeth Scheffield with me to NYC too. Thought I would show my progress. I'm really enjoying working on this one. The over-1 bird took a bit of time....but worth it! 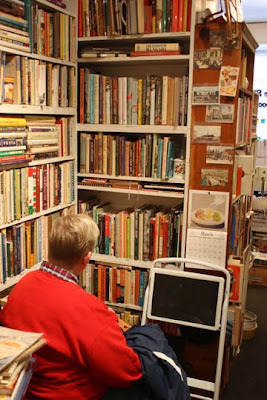 What a great store - I LOVE used bookstores, such character! oooh what fun. Next time there are 2 musts--Sarabeth's Kitchen for breakfast and Tender Buttons. Nice store for sure! Love the pic of your son -- he's a cutie! Love your Elizabeth too! looks like a great place to visit! i can personally vouch for the Betty Crocker's Cookie Book. I got my copy while still grade school and wore it out making yummy cookies. The stitching is just lovely!!!! 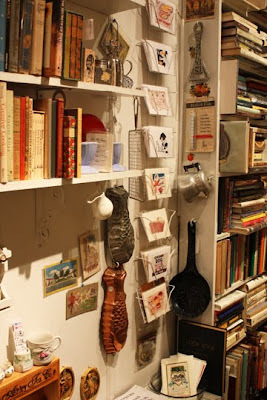 What a nice store - bet I know JUST what it smelled like in there - I adore that "old book" smell. And that bidr! So gorgeous, beautiful color - that's a lot of over one. You're making it verrrrry hard to not throw everything in my project bags over the back of the sofa so that I can start Elizabeth Sheffield!! It's gorgeous! I lived in NYC for many years I miss it. Thank you for bringing us these treasures. The bookstore looks like an interesting find. Can't wait to see what other great places you visited! 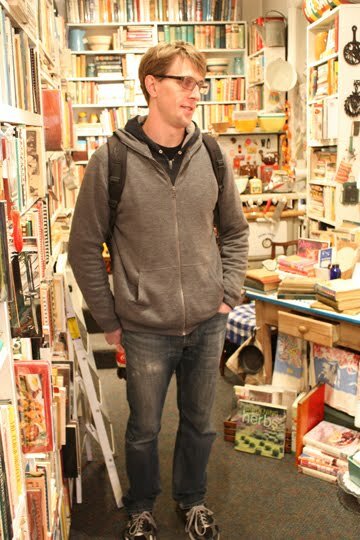 I loved that Book store! 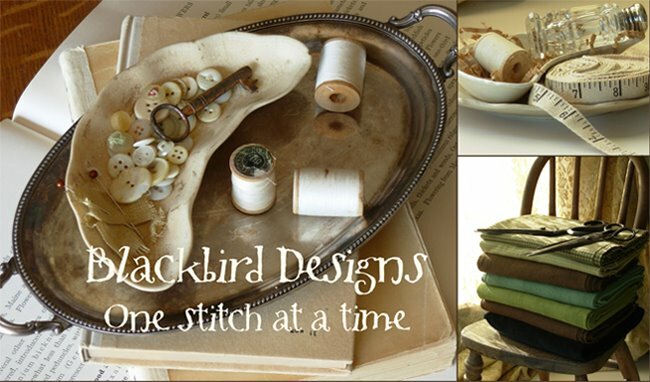 Your stitching is wonderful. Elizabeth Sheffield is in my stash just itching to come out!!! lol I am curious if you are stitching with the suggested threads or if you are changing some of them. I am not too sure about the bright turquoises in it. I like the faded and subdued flavors in the original. I am thinking the colors are probably more like the threads on the back of the original piece where time hasn't changed their true colors. I would of loved to see that fabulous "definitely out of my price range" cookbook. Was it made with a leather binding? I love stores like this and I imagine NY is full of them! 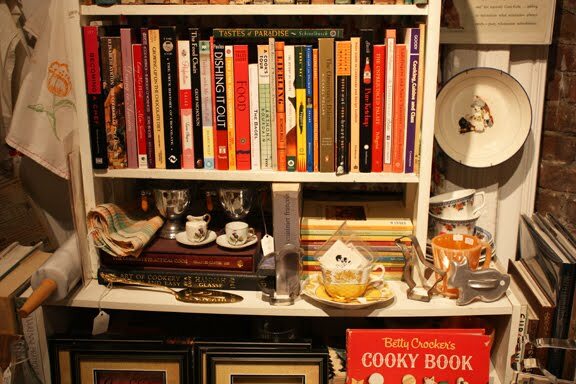 One of your pics shows Betty Crocker's Cooky Book! I was amazed to see it and in such pristine condition! Mine has been used over and over for nearly 40 years and doesn't look anywhere near that nice, but there are a lot of memorable spills and smudges on the pages! I just love to look and buy cookbooks. I love to watch cooking shows on tv. I would know how to cook many things BUT and this is a big BUT, I hate to cook. Weird,hey??? I don't mind baking and I hardly ever bake. I'm lucky thou my husband likes to cook. Lucky for my sons that are grown and they like to cook. Their dad was a good example. What a wonderful store....I would have been there from 1 to 7. Thanks for sharing the pics. Love your Elizabeth too! You bring us into a world of sweetest of the sweet! Thank you so much for sharing your world! I so hope you write about other stores you visited in NYC. I loved this last post. I'm planning my first trip to NYC (from Australia) in October, so any hints and tips will be most welcome!! One of the gals in my quilt group is heading to NYC next month...I told her about the red quilt display! But the cookbook store is the bomb! passed on your blogsite to her so she can prepare for the trip! That book store look fabulous! 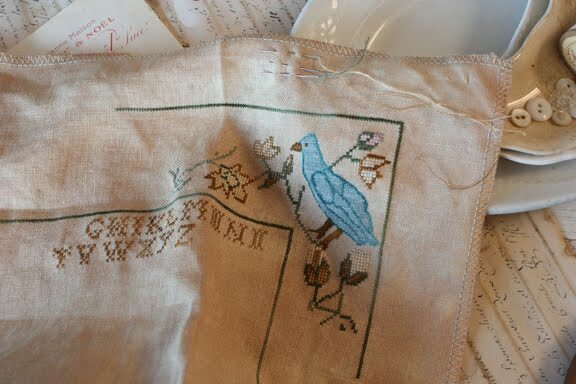 Your sampler looks so beautiful - I love birds in samplers. 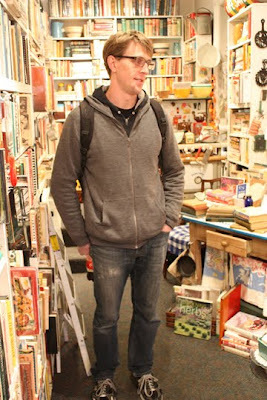 What a fun cookbook shop you visited! Love the bookshop, looks fabulous to browse in there. Must put that on my NY list for hopefully next year. Thanks so much for sharing your visit to this little shop. I haven't been to NYC in a long time -- but this brought me right back there! I love old cookbook and would have been in hog heaven inside that shop. I haven't cooked much from any I have but love reading them. Thanks for including this on your blog. Indeed, this realization is a real wonder, thank you for this article in any case.